Happy New Year, People! In the interest of shining a light on the things that are still awesome about living in Venice in 2013, I recently dug a little deeper into the everyday goings on at the Venice Skatepark. I grew up with my brother's half-pipe in our backyard, smashed my own face trying to drop in off that thing, and was always surrounded by skaters, so I have a soft spot for the whole scene, but also recognize the beauty and importance of this place in our community. 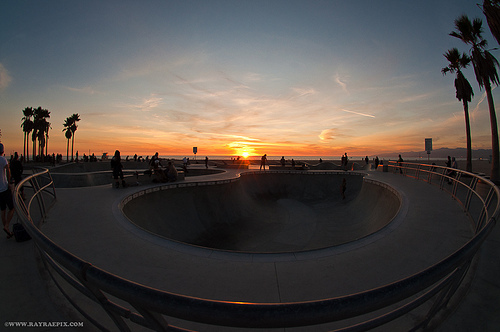 Officially known as the Dennis "Polar Bear" Agnew Memorial Skatepark, this gleaming jewel of a skatepark smack in the middle of Venice Beach is maintained - every single day - by the Venice Surf and Skateboard Association (V.S.A. ), which really means by professional skate legend and V.S.A. President, Jesse Martinez, and his helpers. 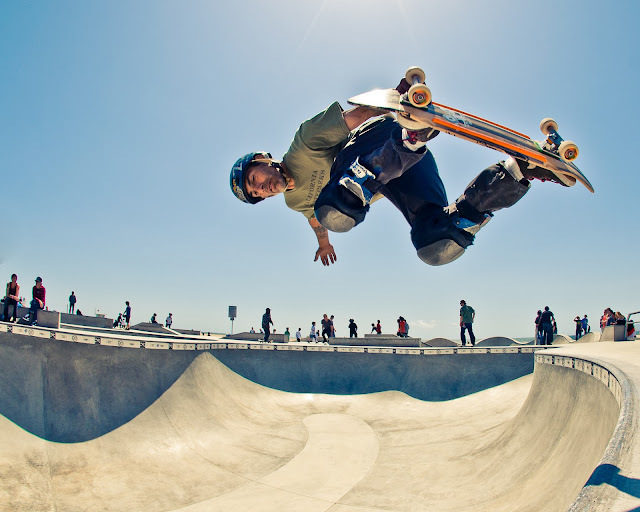 After working for over 20 years to erect a skatepark in what many believe is the birth place of skateboarding, Venice finally got its skate home in 2009, and skaters have been tearing it up ever since. Which is why the maintenance of the park is such a big deal. Many places have skateparks put in by well-meaning skate companies and foundations, or grants or whatever, but then they leave and it's up to whomever else is left to keep it up and running. Venice Skatepark is on Park and Recreation (City of L.A.) territory, but no one from the city has ever stepped a foot into the park to clean it. Ever. ALL the clean up and maintenance of the park is done by beyond dedicated, hard working and meaning it volunteers (hmm ... kind of like The Beachhead). The head of these volunteers is the very reluctant interviewee, Mr. Martinez. He's out there seven days a week, before dawn, cleaning up the sand, glass, piss, blood, booze, graffiti, and whatever else winds up in the bowls of the skatepark overnight. I don't think people really know how much work this takes, and that the skatepark isn't just magically sparkling pristine and perfectly skateable every day on its own. I'm impressed to my core that someone of such legendary skate stature as Martinez (which he completely down-plays every time it comes up - and it comes up a lot down at the skatepark) is the one that willingly gets up at 4 a.m. every day to make sure the park that he and his friends all worked so hard for so long to bring to life, is given the respect it deserves. As impressed as I am though, Martinez isn't. He suggested I go interview a guy who lives down the street from him, a doctor, "that saves kids. THAT'S someone worth interviewing ...". As much as I admire his true humility, I would also argue that Martinez, in his own way, also saves kids. Kids that - because of him - have somewhere safe to skate, which in turn, may be saving them from a more thug life, like the one Martinez came from, and feels that skateboarding really saved him from. He rejected gang life for skate life, and has dedicated most every waking moment to that end. Injured now (ankle), and a couple healing months away from shredding at his normal level, you can feel Martinez just aching to be in there, as he watched the others skate a few days ago, offering pointers (like leaning forward when you drop in, not back. That might have helped me out years ago ...) and encouragement. You can also feel the very tangible respect all the kids down there have for Martinez. Respect not just for his Pro/Dogtown/Bones Brigade status, but for the fact that they can feel the deep care he has for the park, the up and comer skaters, and for skating itself, and that respect is infectious (if also a little fear-based, as no one wants to get chewed out by Martinez and Company). 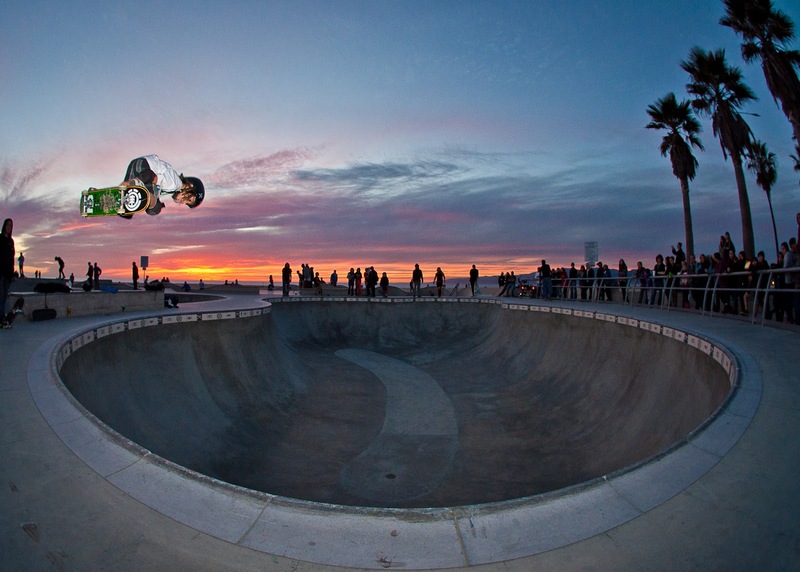 That respect is there because of the specter of Venice's skate past. 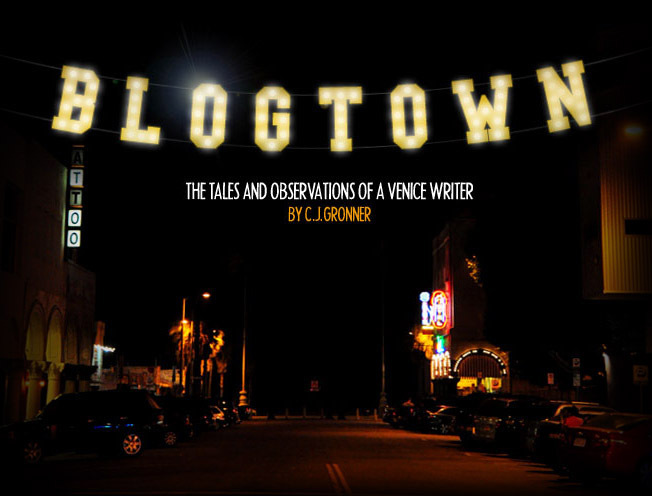 Dogtown, Z Boys, the Bones Brigade ... all those guys had was the streets and the pools, and look what they did with it! They created a legendary time, legendary tricks and styles, and legendary names for themselves. 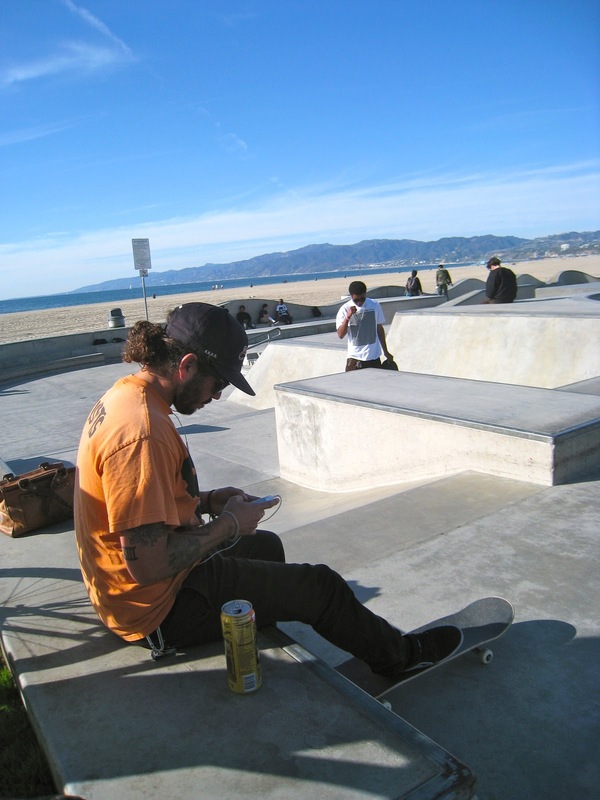 Now that today's skaters have a beautiful skatepark, perfectly kept and maintained by one of their own, they need to step it up, and represent VENICE, like the guys before them did. Martinez remembers when every contest they went to, it seemed like every other name called was "So and So - Venice, California!" Now you're lucky if you hear of one or two competitors called out for Venice. With that gorgeous park as their home turf, we'd like to see some new legends coming out of here. And not just coming out of here, but respecting it on the same level as the guys before them did. Which also means helping. If you appreciate that you get to have this unreal, super clean, amazing view, skate mecca as your home park, maybe you'd like to give back a little too - take turns helping on a dawn patrol clean-up one day a week. Push yourselves to charge it, and not just because you want a cool sponsor or a rad photo in a magazine, but because you love it to your core, like they used to and still do. Have PRIDE, like they used to, and still do. They knew what they represented back then. That is how you stand the test of time. And the Dogtown guys still do, which is why THEY are giving back now, in so many ways. The reason why they're giving back, is to keep that legacy going into the future, to raise another generation of pros from Venice, and to keep the Venice skate scene vibrant and exciting. This is the home of some of the best skaters of all time EVER, and that fact is honored and built upon every day that our skatepark exists. And it exists in large part because of the V.S.A. In talking to Lauren Wiley of the V.S.A., I was very surprised to learn that here is no help from the City of L.A. or Park and Recs with the maintenance. 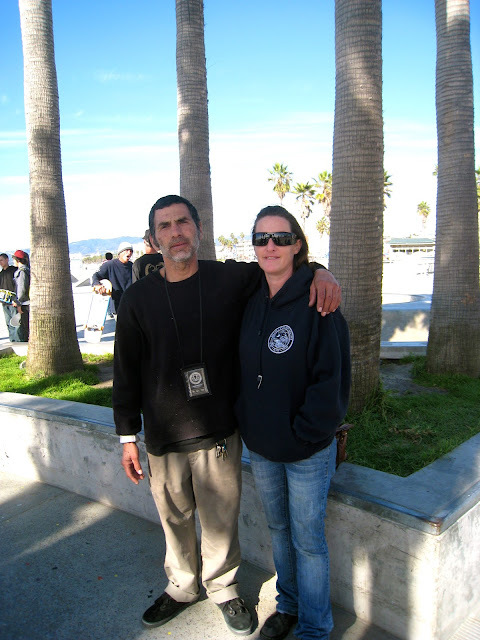 When film crews shoot at the skatepark, they are charged a clean-up fee, which the V.S.A. never sees, nor do they see anyone else out there doing the fee-charged cleaning. When the V.S.A. wants to put on a contest or an event, they are charged for expensive permits and a usage fee by the City - for their own park that they use every day. These fees can run into the thousands, making it hard to pay for simple things like cleaning supplies (which also do not come from the City - but from donations and the V.S.A. 's own pockets), never mind putting on the contests themselves, or even paying a small salary to the guys out there keeping it all clean and safe. They don't see a dime as it stands now, and that just doesn't feel right. Not when they work so hard, and the park is such a tourist attraction, and when it provides such a home away from home for so many of our local kids. Though the V.S.A. is extremely grateful and appreciative for any help they do get from the City, Park and Recs, the "awesome" lifeguards, the LAPD Pacific Division, Councilman Rosendahl (a champion for the skatepark from day one), and from various local business donations, I'm pretty sure we can do better for it, as a community. Like Martinez said, "ALL locals should look out for their neighborhood." Of course. By doing better, I mean getting more involved. Local businesses can be sponsoring events at the skatepark. Local parents, grateful that their kids have a safe, fun - and FREE - place to hang out, could be donating, taking their turn doing some clean-up, organizing fundraisers so that the kids can have contests (like the one coming up in early 2013 for slalom and the crowd-pleasing Highest Ollie! ), attend away contests, get prizes, have a summer camp where kids learn to surf and skate ... and the good ideas just keep flowing. Those kinds of cool things are so possible, but they also cost money. Money that is as scarce at the skatepark as it is most everywhere else, but this is a place where you can actually see the few dollars they do have in action. Ideally, it would be great to have the skatepark take in enough donations and monies earned from contests, summer camps, etc .. that they can be entirely self-sufficient and not have to worry about scrounging funds up from the City and grants and all that to do anything. The V.S.A. has already saved the City multi-thousands of dollars, because if they had to employ (and they would HAVE to) a couple full-time city workers to maintain the park, that would add up in a hurry, especially at the pre-dawn hours that it all has to be done. It would help to actually see those clean-up fees that the city collects from shoots used for clean-up - that they aren't is shady, in my opinion. It would also help to NOT charge those usage fees for use of their own park - that just doesn't make sense, Park and Recs, C'mon! Let's give them a little break. So much good can be done, with just a very little help. SO much good. I talked to V.S.A. 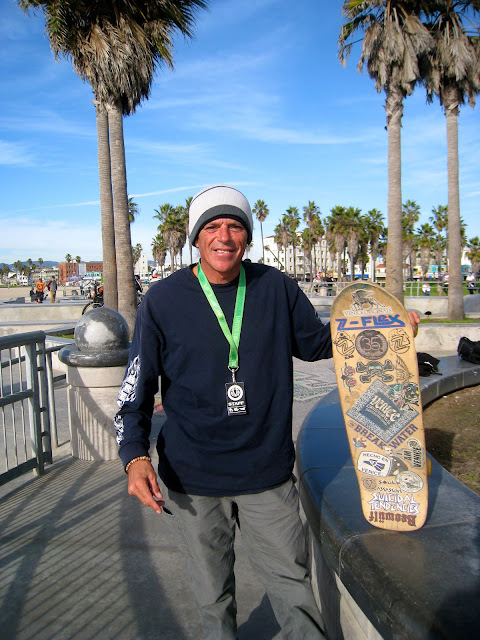 member and the pretty much lone consistent volunteer, Victor Blue, who like Martinez, was born and raised -and hell-raised - his whole life in Venice. After a life of trouble-making, Blue got into skating, which led him to spending pretty much all day, every day at the skatepark, giving back and helping out today's skaters. "I get to be a good example here," Blue told me, after sharing a story about how a local mother interrupted a meeting to find out who this "Mr. Blue" was that her kid had been talking about so much. She wanted to thank him for putting her son on the right path, with his counsel and support every day down at the park. As Blue sees it, "The skatepark is the brightest spot in Venice right now ... this park was built to stop destroying other areas ... and you can see the positivity down here spread through Venice like a virus." Let it! This sentiment was echoed by local skater, Sean Vasquez, who told me that he loves to come skate Venice because "It's one of the nicest skateparks around, it's really well-kept and smooth, which makes your skating better." He went on to say that "It's all about the friendships, and the good vibes. Who wouldn't want to skate on the beach?" I think Martinez and Blue and Wiley alike would be happy to hear that Vasquez also said, "I just come here to relax and skate. This place keeps kids here skating, instead of on the streets getting into trouble ... I do it for the love of skating, which is a lifestyle, not a trend." If Vasquez's sentiments are the common ones held by today's skaters, Martinez may be able to rest a little easier. But he won't. Because he has to get up at 4 a.m. to go clean the park all over again. Please think about that the next time you cruise past the wonderful Venice Skatepark, remember how it got that way, and consider what you can do to help preserve and protect both the history and the future of skating in Venice. Beautiful pics as always Rae and Victor is my hero! Has anyone ever worked on getting a commitee together like the Venice Chamber of Commerce has done for the VENICE sign which obtains "donations" from companies that film the sign? If something like that were possible for the skatepark maybe there would be some funds to draw from! It would keep the park from having to rename itself or push for a sponsoring company. The locals who actually use the park as well as adjacent businesses benefit from the awesome condition it is kept in by keeping the throngs of tourists coming back. I for one thank those who have been so dedicated to its upkeep.